Movements is a pop punk group from Orange County, CA. 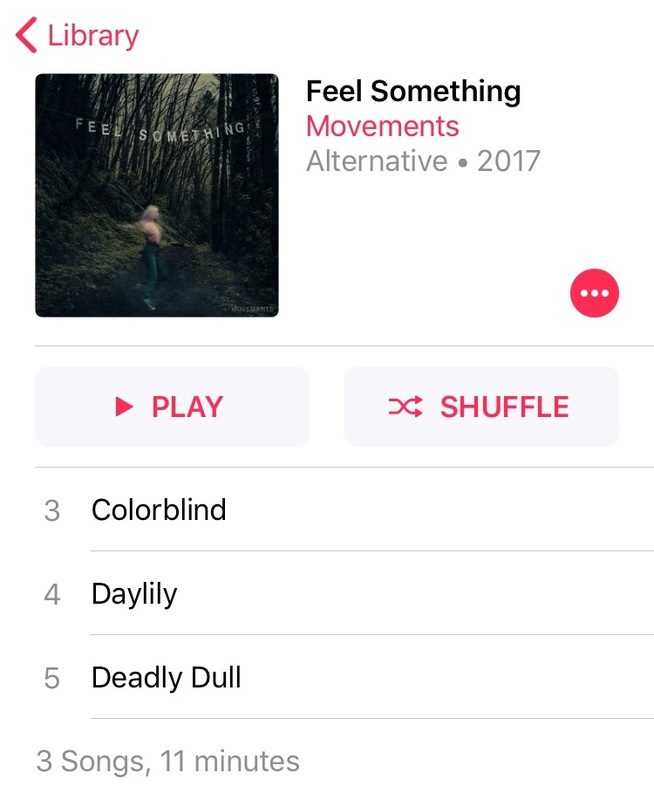 Movements released a new single “Colorblind” yesterday off of their upcoming album Feel Something via. Fearless Records. “Colorblind” is the perfect song to exemplify the music styling of Movements. Patrick Miranda, vocalist, uses spoken word throughout the song. All of Movements songs are emotionally pulling at your heart strings because of the lyrical content. Instrumentally, Movements knows exactly how to build up their sound in a song. Movements announced yesterday that their upcoming album Feel Something will be released on Oct. 20. You can pre-order their upcoming album on their website http://www.movementsofficial.com/home, listen to it on iTunes, Apple Music, or Spotify. If Feel Something is pre-ordered, two additional songs “Deadly Dull” and “Daylily” are available. Movements will be touring with Knuckle Puck across the United States in October and November and will be accompanying Knuckle Puck in the U.K. in November until December. Tickets and tour information can be found here. Sleep On It released their second single off of their upcoming album Overexposed via. Equal Vision Records. The single, “Window” is inspired by the passing of TJ Horansky’s friend’s mother (according to Alternative Press). I’ve recently discovered Sleep On It, and I’m so glad that I did. If you have yet to do so, check out their music. “Window” and “Distant” are two single off of Overexposed which will debut on Nov. 3. You can pre-order their album on their website, on iTunes, or listen on Spotify or Apple Music. Sleep On It is touring with Waterparks, As It Is, and Chapel on the “Made In America” tour from Nov. 6-Dec.7. Tickets and tour information can be found here. This entry was posted in Music Updates, Review, Updates and tagged Alternative Music Blog, Colorblind, Equal Vision Records, Fearless Records, Feel Something, movements, New Album, Overexposed, Pop Punk, Sleep On It, Window. Bookmark the permalink. The Killers released their latest album Wonderful Wonderful today via. Island Records. This is the fifth studio album released by The Killers since Battle Born in 2012. You can listen to Wonderful Wonderful on Apple Music, Spotify, iTunes and can be purchased at your local record store. In other news, new songs were released by Too Close To Touch (“Leave You Lonely“) and CITIZEN (“Flowerchild.”) There are new music videos for Broadside (“I Love You, I Love You. It’s Disgusting,“) MAKEOUT (“Ride It Out,”) The Maine (“How Do You Feel,”) and The Hunna (“Summer.”) Tickets are available for All Time Low and Pierce The Veil’s headlining tour, Milky Chance’s “The Blossom Tour 2018,” and Coin’s “The North American Tour.” What songs have you been vibing to lately? All the new releases this week have been quality works! *Follow me on Twitter and Instagram @ovictoriamedia and let me know what you would like to read about next! This entry was posted in Music Updates, Updates and tagged All Time Low, Alternative Music, Broadside, CITIZEN, COIN, Flowerchild, How Do You Feel, I Love You I Love You Its Disgusting, Leave You Lonely, MAKEOUT, milky chance, New Album, new music, New Songs, pierce the veil, Ride It Out, Run for Cover, Summer, The Blossom Tour 2018, The Hunna, The Killers, The Maine, The Man, The North American Tour, Too Close To Touch, Wonderful Wonderful. Bookmark the permalink. New Singles and Tours Announced! Knuckle Puck released their latest single “Double Helix” which is one of two singles [“Gone“] off of their upcoming album Shapeshifter set to release on Oct. 13 via. Rise Records. The Story So Far released a new song “Out Of It” and announced a tour across the United States. The tour begins Nov. 3 in Fresno, CA and ends Dec. 3 in Bloomington, IL. Tickets and tour information can be found here. I The Mighty announced a Fall 2017 tour with Hail The Sun and Good Tiger across the United States. Tickets and Tour information can be found here. Brand New released via. Twitter that Nada Surf will be joining them on tour across the United States for their October tour. Circa Survive released the music video for “Premonition of the Hex” off of their upcoming album The Amulet set to release Sept. 22 via. Hopeless Records. The music video for Seaways’ “Lula On The Beach” debuted this week. This entry was posted in Music Updates, Updates and tagged Ahead of Myself, Alone, Beach Boys, brand new, Circa Survive, COIN, Double Helix, Fall Out Boy, Good Tiger, Hail The Sun, i prevail, I The Mighty, Knuckle Puck, Lula On The Beach, Nada Surf, neck deep, new music, new singles, Out Of It, Premonition of the Hex, Seaway, Shapeshifter, The Amulet, The Last of The Real Ones, The Peace And The Panic, The Peace And The Panic US Tour, The Story So Far, Tour updates, Weezer, X Ambassadors. Bookmark the permalink. Chicago natives Sleep On It released their new single “Distant” earlier this week. “Distant” is the first single released off of Overexposed which is set to debut on Nov. 3 via. Equal Vision Records. The pop punk group formed in 2012 and since released their first EP Everything, All At Once independently. Sleep On It released two EPs after and had additional producers including State Champs vocalist Derek DiScanio and Seth Henderson (Knuckle Puck, Real Friends.) Overexposed is Sleep On It’s first official full length studio album under Equal Visions Records. This entry was posted in Music Updates, Updates and tagged Distant, Equal Vision Records, new music, Overexposed, pop punk music, Sleep On It. Bookmark the permalink. Former members of Major League, Brian Joyce and Matt Chila has joined forces with A Loss For Words Mikey Adams to form a new group collaboration, Commūnion. Over the past year, Commūnion released two song: “Blow“and “Runway Love.” Their latest song is “Americana Summer” that has been promoted throughout their social media and released to the public on Tuesday. Each single made public by the group has been written and performed by Commūnion. The single was released with a music video that is filmed by James Morano. There is no word yet if an album is in the works or if Commūnion will be touring. You can hear the single “Americana Summer” on Spotify, Apple Music, Pandora, Youtube, and more! To learn more about Commūnion, check out their Twitter (@CommunionUS,) Instagram and Facebook page. their website www.communionband.com. This entry was posted in Music Updates, Updates and tagged A Loss For Words, Alternative Music Blog, Americana Summer, Architects, Being As An Ocean, Black & Blue, Blow, Brian Joyce, Commūnion, Commūnion Band, major league, Matt Chila, Mikey Adams, music blog, New song, Runway Love, UK Tour. Bookmark the permalink.